Refill Toner supply discount toner refills for your laser printer cartridges. Refilling empty cartridges with our refill toner saves money and recycles your cartridge. 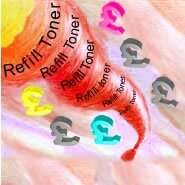 Our refill toner is quality toner which allows you to refill your toner cartridges several times. Save money! - Do it yourself - Fast and easily ! For many models you just pull out the plug and pour the refill toner in through the funnel top we supply. Simple! No mess! Order your Alcatel Greentouch Quik refill toner on our TonerTopUp website now! Click on the link to the left to order your toner refill now! Refill toner bottle with screw on funnel top. The Alcatel Greentouch Quik is one of a range of models sharing a common "engine". These may be badged by different manufacturers. They have the following range of cartridges. Do not be concerned if the refill toner for your Alcatel Greentouch Quik has what appears to be an unrelated name. This is because of the sharing of the engine between different makes and models. These are general instructions for this fill method. We supply specific instructions for the majority of printers with the toner. These have a picture showing exactly where to melt the hole. First of all prepare your worksurface. Working in an area of subdued light, cover your work surface with some newspaper. You may choose to wear latex gloves or use a dust mask. Take care not to touch or damage the imaging drum on the bottom of the Alcatel Greentouch Quik toner cartridge. Greasy marks or nicks in the surface will ruin the print quality. The key tool in our starter kit is a standard soldering iron with a specially designed tip. This makes it very easy to make a hole in the Alcatel Greentouch Quik toner cartridge. Just plug in the soldering iron, let it heat up for three minutes. In a few seconds you have the desired hole! Then give the toner bottle a good shake to get air into the powder so it flows easily, remove the top and seal and screw on the spout shaped cap supplied with the Alcatel Greentouch Quik refill toner. You can now pour the Alcatel Greentouch Quik refill toner into the Alcatel Alcatel toner cartridge leaving an air space at the top. Wipe any loose Alcatel Greentouch Quik refill toner off the outside round the hole with a duster. Seal the hole with one of the plastic grommets from the kit (or a bit of sticky tape) so that it does not leak. Replace the cartridge into its lightproof plastic bag. Clean away any spilt toner and you are done! Note that you have done nothing to disturb the cartridge. If it had packed up because it had run out of toner you should have it back in action without affecting any components. We provide a few extra tools in the kit which you will not routinely need but can be handy on occasion. In case the plastic disc you have removed in melting the hole falls inside the toner chamber, we provide a small torch, a screwdriver and a pair of long nosed pliers so you can locate and remove it. We also include a pair of latex gloves to keep your hands clean, a duster to help you clean any spills, and a couple of sheets of newspaper in case you have none handy to work on!...... Oh yes!...... there is also a small surprise to keep you occupied whilst you wait for the tool to heat up! See the instructions provided for emptying the waste toner. The waste toner can build up and permanently damage the toner cartridge during the first refill. Emptying it each time you refill ensures that the toner cartridge lasts for the maximum number of refills (typically three). You have probably got the idea now that the manufacturers are doing their best to protect their large toner cartridge profits from people like you who want to refill their own cartridges and from the remanufacturers who offer a better priced replacement. In recent years they have added electronic chips to some cartridges which monitor how much toner is left. It would be fine if that was all they did but some of them also close down the machine when it goes low....... and refilling it won't reverse that. So for some machines you need to screw or plug in a new chip before your refilled cartridge will work. We either supply the chip with the toner where it is always needed or else, where one chip lasts for several refills, we draw your attention to it so you can buy it separately. Click here to view information on our products for the Alcatel Greentouch Quik and to order! We sell compatible and not original toner. Any names used on this web site are used for identification purposes only and are hereby expressly acknowledged as the trademarks of their respective owners. Bottles may contain more or less than is required for any specific model.